Etekcity LED Desk Lamp!! What A Deal!! Care Your Eyes - Energy-efficient LED provides flicker-free lighting for reading, working, studying and sleeping. Colorful Night Light Base - Choose the perfect mood of the atmosphere with a full color spectrum of base lighting control. Touch Control - Sensitive touch control for easy lamp brightness and the color of the night light base adjustment. Mobile Use - Rechargeable 1000mAh Li-on battery for everywhere using and light up to 2.5-6 hours for wireless using. 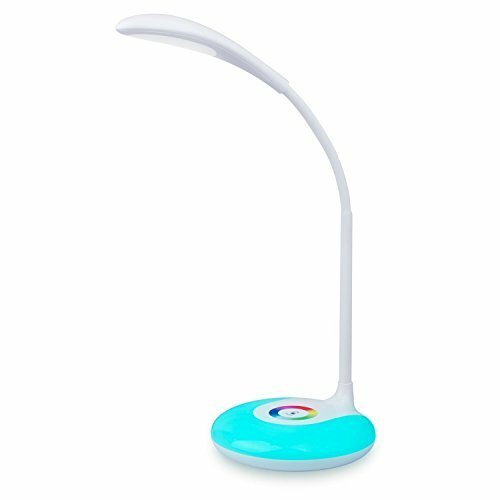 Service and Package - 24 Month Warranty, Etekcity Color LED Desk Lamp, Power Adapter, Micro-USB Charge Cable (3.28ft), User Manual.